The H20 is a robust and fully-submersible lighting assembly that is ideally suited to exterior lighting applications. This IP68 vehicle LED features a low-profile design, which saves space and makes it ideal for mounting on vehicles. 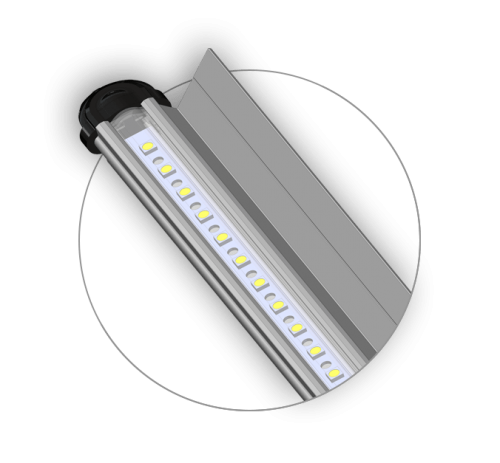 Combining the H20 with an optional aluminum extrusion provides an exceptionally efficient and versatile light, especially for ground lighting. Ideal as an emergency vehicle LED, the H20 offers a strong, long-lasting, low-power, high-output ground light that can be relied upon while staff focus on their work. In addition to the standard clear white lens, utility white and red colored lenses are also available for easy customization. H20 comes in 12” (30.48 cm), 20” (50.8 cm), and 40” (1.016 m) lengths, allowing you to choose the best output for your needs. Also included is the Luma Bar® current limiting device, which will shut off in the event of an electrical surge and resume once normal operating conditions are met. Both 12v and 24v models are available. Ground lighting for airports, emergency vehicles, and military vehicles. May be vehicle mounted or used as a standalone light. Double leads are available for chain installations.